'TXL Wizard' is fast, easy and accurate. Convert simple to complex text files to csv or Excel. Remove the potential for human error! We've made it so simple anyone can use TXL Wizard with the command line. Zero training required. Regardless, we are always here to help you implement our software. Use the command line with the Windows scheduler and automate everything! Process huge number of files with similar table structures (but with different data/number of rows). Powerful, fast, recipe driven, and very easy to use. Process huge number of files with similar table structures (but with different data). Eliminates the possibility of human error when moving data from text to CSV/Excel. Command line has been made so simple anyone can use it with no training at all. Automate 'TXL Wizard' using the command line. Run in batches. Optionally use Windows Scheduler for complete hands free conversion jobs. Automatically reads text reports and creates a CSV or Microsoft Excel spreadsheets files. Three methods to handle most text file formats (Profile, Recipe and File Marking). Compatible with future changes in input format with minor changes. New Recipe/Profile creation/editing typically takes a few seconds to a few minutes depending on complexity. Installed with many examples for training purposes. Special Promotion: Buy 'TXL Wizard' and get 'Convert XLS' free! Need to Convert Text to CSV? 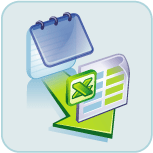 'TXL Wizard' is a simple to use, yet powerful tool specifically designed to convert text files to CSV (character/comma delimited) files and Excel files. If you need to convert one or thousands of files, located in one or many folders this is the tool! Conversions can be done 10-20 times faster without using MS Excel. Save/restore all details of a conversion task by saving/opening a 'Conversion Job' file (*.txl) from the file menu. The same conversion job file can be used within the command line for quick automation. Combine this with the Windows Scheduler and you can take that vacation to Maui you've been dreaming of! TXL 'Conversion Job' files which are saved from the user interface File menu. BAT files created by you using the command line specification in the help file. Third party apps that have command line interfaces. The best method of conversion will depend on the input text file layout/type and any features you find necessary. The table below will help you quickly choose. If you are not sure which method would be best, send us an input file. The input file need not contain proprietary data, dummy data is sufficient. Email us at (Our response time will impress you). Fixed Width Text File format. Usually a single table. File type may be ASCII or UNICODE. Supports both Windows/Unix style text files. Excel not required for text to csv conversion! You may choose the delimitation character within the CSV file. Normally a comma, you can alternatively create tab delimited, bar delimited text files. In fact you can pick any character you want. If you have the specification for your fixed width text file, using this method is very simple. Use the built in Profile Editor to tell TXL Wizard the width of each column. Additional properties may be specified for each column such as: Padding character to use, Alignment (which side to pad), Remove column from output, Reorder column in output. Recipe 1 to many tables of varying format can be within this file. Typically a unique marker denotes the start and end of the table(s). Ending marker not required for the last table. Text file can contain TAB characters. Supports both Windows/Unix style text files. Excel not required for converting to CSV. Input text file can have multiple tables of varying format/size. Output Excel files can optionally be pre-existing which will allow for the preservation of previously saved formatting information. That means you can transfer text file data directly into a pre-formatted Excel file. If converting to CSV you may choose the delimitation character. Essentially, you will write a recipe, using the recipe editor. This recipe tells TXL Wizard the position and format of each table you want to convert. The format for the recipe is quite simple. Once mastered this method is extremely powerful. File Marking Same as Recipe. Same as Recipe. This method requires that you modify the input file with special character sequences typed directly into the original document. This may be easiest choice if you only expect to process a given text file once. The Profile and Recipe File method can be used to process similar text files and requires specifying a profile/recipe only once. This profile/recipe can then be applied to multiple documents. If you anticipate having many files with similar layout, the Profile or Recipe method may be the appropriate choice. Keep in mind, similar layout does not mean each input text file must be exactly the same. The number of rows in a given table can be different for example, and the same profile/recipe will work. 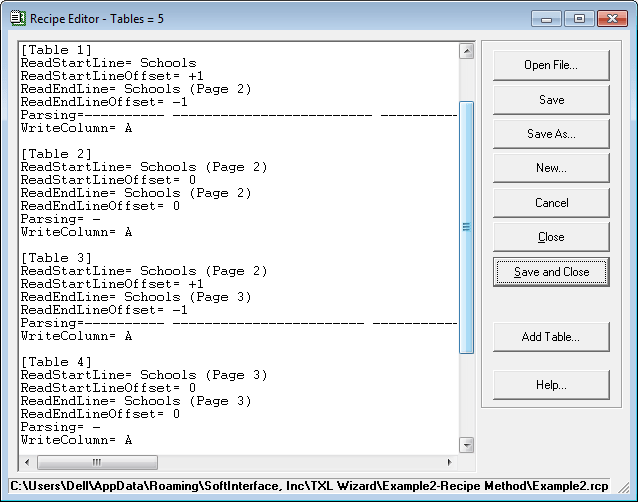 For the recipe method what must be similar between files are specific text strings that the program uses to denote the start and end of a table. 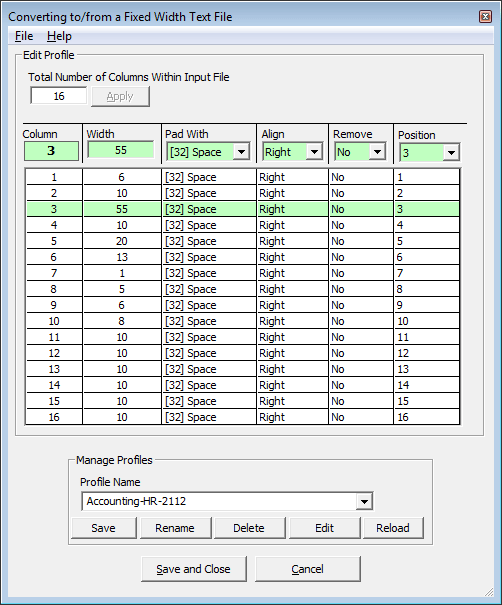 For the profile method, the specific widths, padding, and alignment used for each input file must be identical. Below we show a couple of snapshots of 'TXL Wizard' the most comprehensive "Convert TXT to CSV" tool ever built. The command line is extremely simple with TXL Wizard. In fact you need only to use the user interface to set up exactly what you would like done, go to the File menu and save a 'Conversion Job' file. A 'Conversion Job' file is saved with the *.TXL file extension. This file extension will be recognized by your operating system as a TXL Wizard file. So simply double clicking the ConversionJob.TXL file from Windows Explorer, or specifying it within the Windows Task Scheduler is really all you need to do. The TXL file is a simple text file that can be easily understood and modified within any text editor. See the TXL File Specification for modifying the way the conversion job is done. These will work without modification provided you installed in the default folder. For a full discussion and list of command line switches please refer to the Command Line Manual for TXL Wizard. Email us at if you have any questions or need additional examples. We will get you up and running fast! After all, converting text to csv files is what we do for a living. "Your wonderful utility took a mere ten minutes to append all 22,000 files into one gigantic 2 gigabyte file. For comparison purposes, the program that wrote the files took approximately 30 hours to write out said 22,000 files. System: 1GHz Pentium/512 Meg RAM Laptop"
Simple methods to convert your Text files to CSV Files. Profile, Recipe and Mark-up. 'TXL Wizard' is compatible with Office 97 through Office 2019. Yes, we've been at it that long!